Babies need to be stimulated in order for their brain to make connections. The more connections their brain makes, the more chances they have to grow to become intelligent. Babies need to be stimulated by a variety of activities, colors, and shapes. A baby mobile is not only a great way to soothe and entertain your baby but also a way to stimulate his or her brain. A mobile stimulates your baby's sight and hearing. It provides visual stimulation through high contrast colors. It also encourages pre-reaching activities. 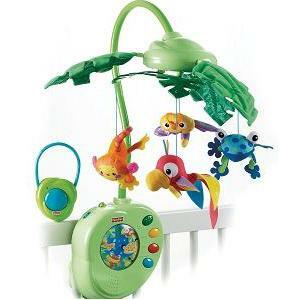 Baby mobiles also play sweet songs which stimulate hearing and soothe your baby. When choosing a baby mobile, make sure that the toy attachment is face down the baby. For safety, choose a baby mobile that has not sharp, toxic, or ingestible parts or that can restrict your baby's movement. We recommend two mobiles that we believe are among the best: our first choice is the Fisher Price Rainforest Musical Mobile. The Fisher Price mobile helps create a soothing atmosphere with its soft lightning and calming sounds of nature. It also stimulates your newborn's senses with music, motion and lights. Our second choice is the Tiny Love Nature's Serenade Mobile. It is maybe not as good as the Fisher Price one when it comes to soothing your baby, it is however very good when it comes to stimulating your baby's senses. This mobile has animals wiggling up and down captivating the newborn's attention. It also plays beautiful music.